Governor Larry Hogan signs the new oyster funding agreement. Photo by Joe Andrucyk. Governor Larry Hogan announced today that the Maryland Department of Transportation and Maryland Department of Natural Resources have entered into a new agreement that will provide millions of dollars for ongoing oyster activities in Chesapeake Bay. The new four-year agreement will provide $2 million annually from the Transportation Trust Fund to the Department of Natural Resources for ongoing and future industry efforts, including dedicated funding for equipment, labor, material, supervision and support. 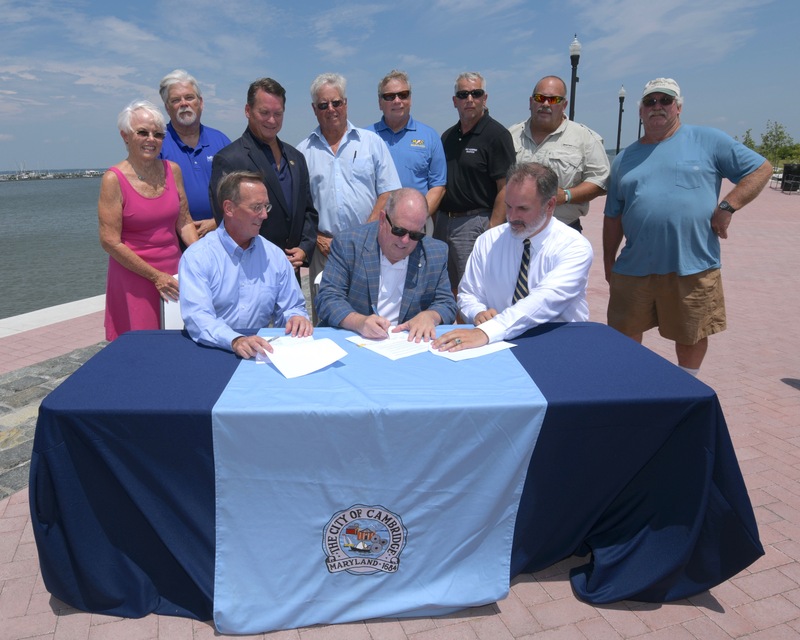 The extension was signed by Deputy Secretary Ports and Natural Resources Secretary Mark Belton – witnessed by Governor Hogan –following the dedication of the recently reconstructed Cambridge Marine Wharf, located near Sailwinds Park. The dedication and signing ceremony was part of Governor Hogan’s Mid-Shore Regional Cabinet Meeting that covered Caroline, Dorchester and Talbot counties. Increased funding will go toward oyster propagation and replenishment efforts through 2023 with no less than $925,000 annually going to support the wild oyster fishery, with the Department of Natural Resources coordinating with county oyster committees and watermen on shared projects and priorities, including the establishment of oyster seed areas, monitoring, sampling, seed and shell plantings, surveying and transplanting. The Chesapeake Bay Enhancement Program between the Maryland Department of Transportation and Maryland Department of Natural Resources was first signed in 1996.